August 24, 2016, City of Industry, CA, USA – Tenda Technology Inc., a subsidiary of Shenzhen Tenda, is pleased to announce the AC9, a next generation dual-band gigabit WiFi router that brings your home internet up to date with blazing speed and uninterrupted connectivity. This router is great for streaming HD video and for game players, perfect for file and printer sharing, and also ideal for general internet use. The AC9’s powerful WiFi provides whole home coverage, even in large homes – reaching areas that older routers cannot. 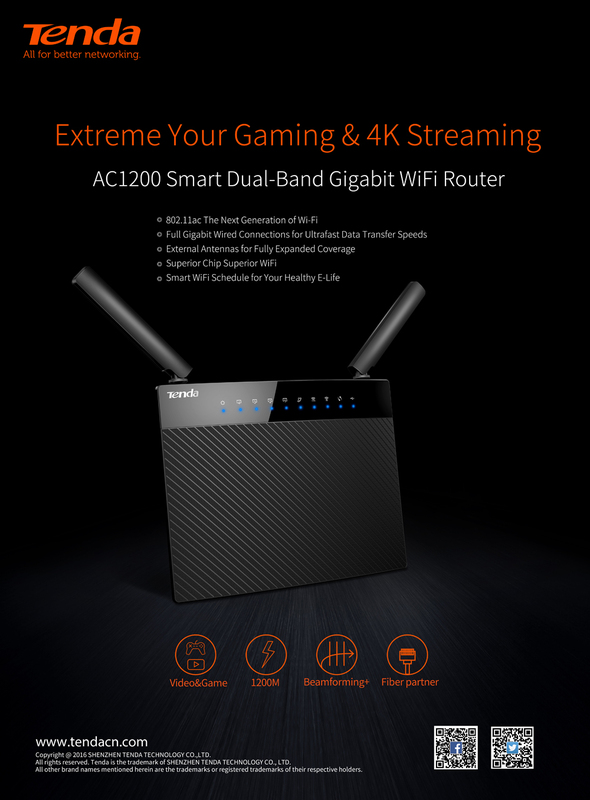 Tenda’s AC9 router delivers stable online gaming and glitch-free 4K streaming from YouTube, Netflix and other sources. 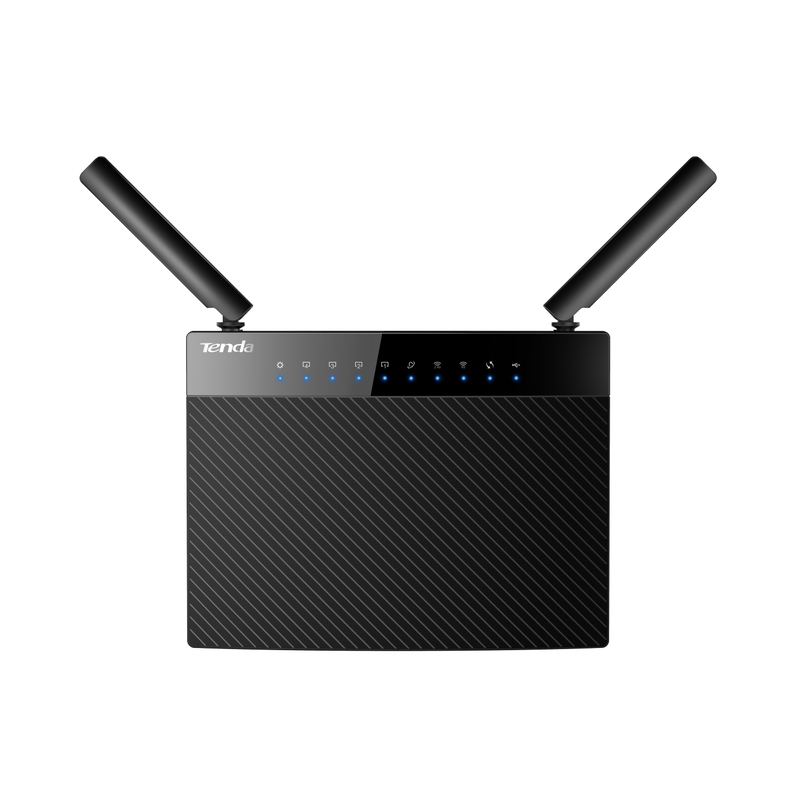 This router supports the next generation 802.11ac WiFi standard, with a total bandwidth of up to 1167 Mbps – three times faster than the wireless-N standard used by the majority of routers in homes today. The AC9 offers dual band coverage. The 5GHz band provides speeds of up to 867Mbps, while the 2.4GHz frequency’s data throughput exceeds 300Mbps. The AC9 is based on the powerful new Broadcom ARM Cortex-A7 CPU with 128 MB DDR3 memory, ensuring it can handle multiple simultaneous WiFi connections without ever stalling or slowing down. The AC9 router brings its fast WiFi signal to every room of the home, delivered by its high powered amplifiers and twin external antennas with beamforming technology. In a typical home scenario, the total WiFi coverage area could be up to 4,000 sq ft, even including hard to reach areas such as the basement and garage. The AC9 offers more than just WiFi – it’s the heart of your home network. There’s a fast USB 2.0 socket to attach a printer or external file and media storage devices. The connected USB devices can be shared by everyone connected to the WiFi network. There are five gigabit LAN ports to directly connect PCs and consoles to the router, plus a gigabit WAN port to ensure a fast and stable connection to the internet. The free Tenda App provides the smartest way to set up and manage your network, locally and remotely, via a mobile phone, tablet or other device. The app allows you to check connection status and the upload and download speed of connected devices, and run error diagnosis if required. The app also offers numerous other features, including easy remote control of functions such as WiFi scheduling, parental controls and power saving features. 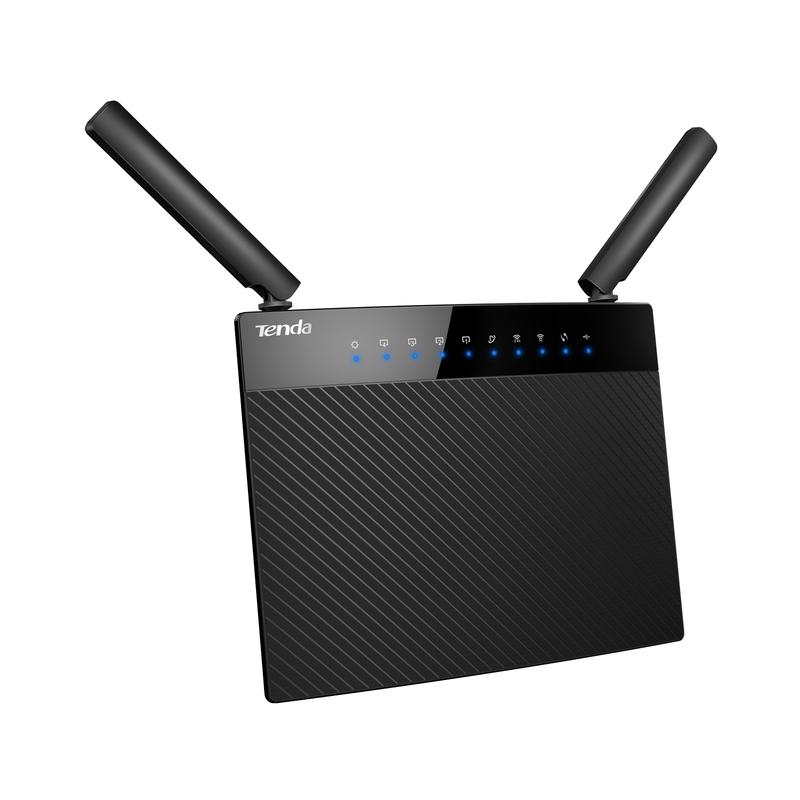 The AC9 supports one button WPS (WiFi Protected Setup) for quick and easy WiFi setup.